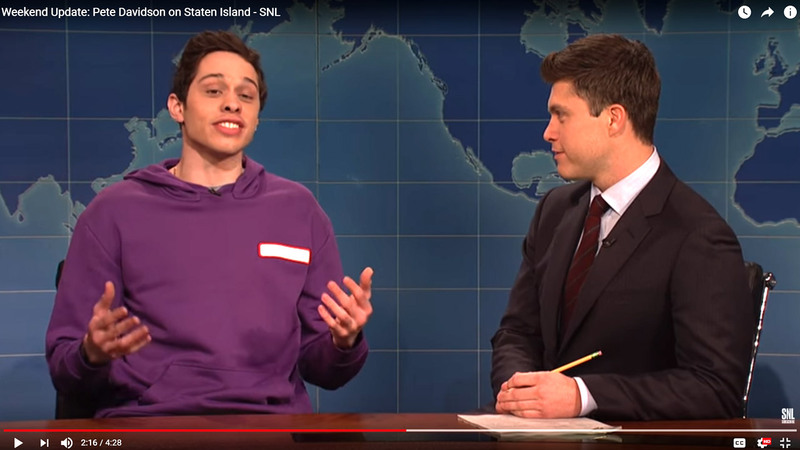 NEW YORK (WABC) -- A Staten Island native who works on the cast of "Saturday Night Live" went on a rant during this weekend's show, bashing his hometown by calling it a drug-infested and racist island. The segment about going home for Thanksgiving included comedians Pete Davidson and Colin Jost -- who are both from Staten Island. But Davidson took a bit more negative approach saying he isn't looking forward to visiting his hometown for the holiday. "I feel like my hometown really doesn't like me," Davidson said. He added it's probably because he once said in an interview that he "wished that when Hurricane Sandy had hit Staten Island, it had finished the job." But Davidson continued on, saying, "I'd be just as happy if there were no hurricane and Staten Island just fell into the sea." His next jab took on the fact that the Staten Island Ferry is a free service. "If Staten Island is so desirable, then why is it free to get there?" And then his tone got more serious: "I know it's not all heroin and racist cops, it also has meth and racist firefighters." Jost defended his hometown, saying, "What you're describing is not the Staten Island I know." Davidson then pulled out all stops, and included himself in his bashing. "The reason that Staten Island hates me is because I represent what they are -- a mentally ill community college dropout who got a Game of Thrones tattoo before watching the show." What do you think about Davidson's rant? Tell us in the comment section below.